Built in 1880 at a cost of $1,700, the building is constructed of wood entirely from this area. Its architectural style is called “Carpenters Gothic,” and its quiet intimacy lends itself to special programs, services and pondering. The Penn Church has been used for weddings, memorial services, a baptism and meetings of local community groups. As was his wish, Mr. Lowe’s memorial service was held in the church on October 9, 1995. The history of the church dates back to the Quakers who settled in Cass County in the 1820s. 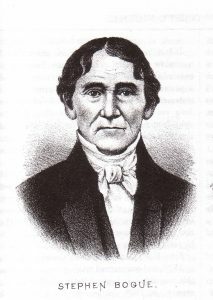 Many were strong abolitionists, active in helping slaves escape along a major route of the Underground Railroad that went through Cass County. The Penn Friends Meeting House stood at the corner of Penn Road and Quaker Street in the village of Penn about two miles east of the foundation. In 1972 an addition was built on to the church, and in 1987 they offered the original meeting house to Ed Lowe, to make way for a new sanctuary. 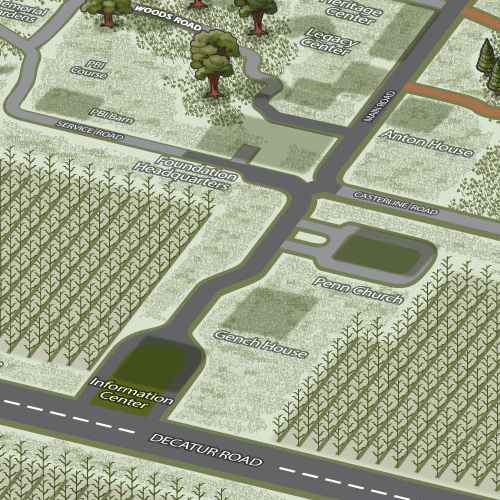 * Ed acquired the building and moved it to its current location at Big Rock Valley. Restoration was completed the following year. The Lowes decorated the interior typical to New England style and added the fieldstone entryway. They chose pews with kneeling benches and incorporated stained-glass windows they had purchased from the Episcopal Church in Three Rivers. Ed made the wooden cross that hangs at the front. He built it one Christmas, and he and Darlene hung it at the Cabin instead of a traditional decorated tree. After Ed’s death Darlene moved the cross to the church. 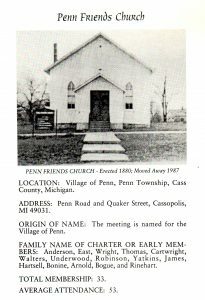 *There is still a Penn Friends Church in the Village of Penn. The new sanctuary was added in 2002.